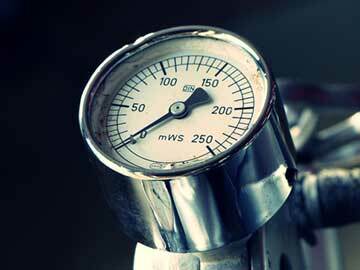 There are a variety of reasons why you would be experiencing high water pressure in your home. Truthfully, many homeowners don't even realize that their water pressure is higher than it should be. Listed further down in this article is a list of symptoms you should look at to identify if your water pressure levels are above normal. So, what are the causes of high water pressure in my home? The cause could be a problem with your water pressure regulator or your thermal expansion relief device. It could also that the location of your home (if it's at the bottom of a hill) plays a part in the water pressure levels. In this article we'll give you information you need about how to identify if you even have high water pressure and what you can do about it. Why Did My Water Pressure Increase? If you suddenly notice that the water pressure from your shower head or sink is stronger and you are possibly hearing loud noises inside your walls - well your water pressure may have just increased suddenly. What would cause that to happen and more important, what can you do about it? If you are on city water, call a neighbor or two and see if the same thing has happened to them. If so, it may be that your water company (for whatever reason) increased their distribution pressure. If the high water pressure only lasts a few seconds, then it may be that you are having a problem with your expansion tank (if you have one installed). If the water pressure remains high the entire time the water is running, then the problem may be with your water pressure regular. You may not know that you can (and should) test your water pressure. After all, you don't want it to be too low or too high so getting it just right will lengthen the lifespan of your water pipes and your appliances. Purchase a pressure gauge at your local hardware store or online. Here's one at Amazon for $5.89. Go to an outside faucet and attach the pressure gauge to the faucet. Make sure the needle of the pressure gauge is at 0. Turn on the faucet and see where the needle goes up to. It should be no lower than 45 psi (pounds per square inch) and no higher than 80 psi. Repeat this process with several (or all) the faucets in your home. Why Is High Water Pressure A Bad Thing? Yes, it's true that high water pressure is better than low water pressure when it comes to showering and maybe washing your windows or car but it does come at a cost, literally. It causes about twice as much water to flow through your water pipes - much of which will be wasted. And yes, you will be paying more for your water because of this. It puts an excessive amount of stress on your plumbing system. It decreases the life span of your appliances that use water (i.e. dishwasher, washing machine and water heater). We mentioned earlier that the location of your home may be a factor in your high water pressure problems. If your home happens to be near a fire hydrant or tall buildings you may have water pressure issues because cities and towns normally keep the pressure higher in these areas. If you happen to live at the bottom of a hill (which is common here in Georgia) gravity may be causing or contributing to your high water pressure problems. Now, you can't pick up your home and move it to a new location but we can offer you some solutions to these problems. Each individual case is different so please call us and we'll be happy to send out one of our plumbers to help you solve your high water pressure problems. Otherwise - for most other causes of high water pressure you can fix the problem by using a water pressure regulator (aka water pressure reducing valve). If you're a DIY kind of person you can install it yourself or you can call in a plumber to do the work for you. Water pressure regulators are a safety feature and are required by code. High water pressure can cause leaky pipes, pipes to explode, leaky fixtures and premature failure of faucets and fixtures. High pressure can cause underground water leaks that may require leak detection or water line pipe replacement or repair. Most emergency leaks typically have high water pressure caused by failed regulators or no thermal expansion relief device. Pressure regulators come in all sizes. Common preset pressure is 40-60 PSI. Common incoming pressure max is 200-300 PSI. And adjustable working range is typically 25-75 PSI. Special order regulator can be purchased with set ranges higher or lower, for situations where you may want to lower the pressure in the same line at different location in the system. How do I know if my water pressure regulator is bad? If your water pressure has changed or you have no pressure at all the chances are that something has gone wrong with your water pressure regulator. If you would like your water pressure issue resolved, give us a call today and let our expert technicians diagnose and solve your water pressure problem. What is the recommended house water pressure? In Georgia, a good water pressure reading is 55-75 PSI. If the reading is above 80, it's considered to be too high. How do you measure a home's water pressure? Use a water pressure gauge (which you can purchase at any hardware store). Simply turn off any running water, fasten the gauge to an outside faucet and check the reading. Repeat the process with your indoor faucets. If you suspect you are having high water pressure problems in your residential or commercial property, call the Atlanta plumbers - Atlantis Plumbing today at 770-505-8570. We are available 24 hours a day, 7 days a week.